Stone soup anyone? This delicious-looking bowl that Donna Ernst, an Oregon Agate and Mineral Society member, holds is made of Texas river rock and Mississippi mud. All the “food” on this dinner table is actually rocks and minerals, she says. 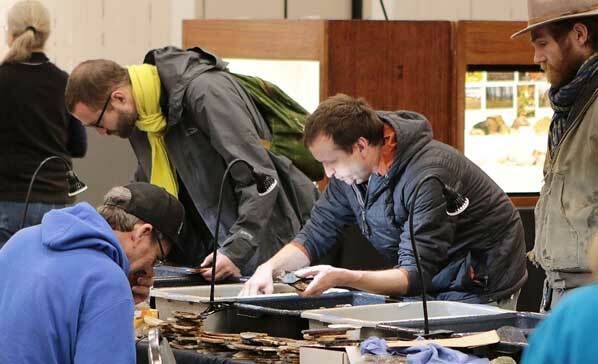 Established in 1933, making it one of the oldest groups of its kind in the United States, the Oregon Agate and Mineral Society (OAMS) held its 68th Annual exhibition and sale on the weekend of February 22 at Southeast’s Oregon Museum of Science and Industry. Standout features included the Oregon State Seal created from a large variety of Oregon stones an active Kids’ Corner; and hand-crafted jewelry and window hangings made by OAMS club members. One of the show’s participants, Doug Wheaton says he admires the banding on this sample of Brazilian agate that he’s showing. Kendel White looks on, while her daughter, Aria, is clearly delighted at her lapidary find. 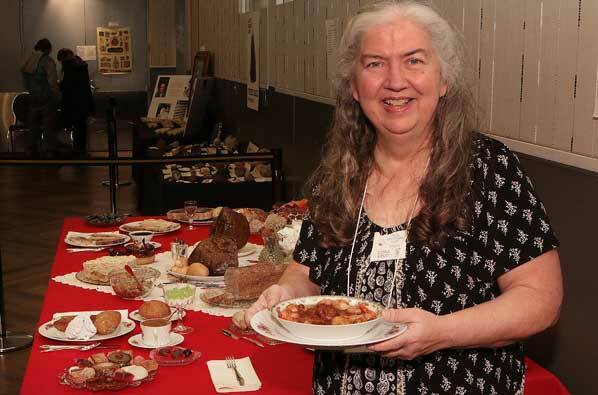 “Rock enthusiasts come to the show because we have many unique and special rocks and minerals for sale, both ‘finished’ and in their natural state,” Wheaton added. It’s like going on an “Easter Egg hunt” every time the members head out for a field trip, some of which Wheaton leads if weather permits, he told East Portland News. 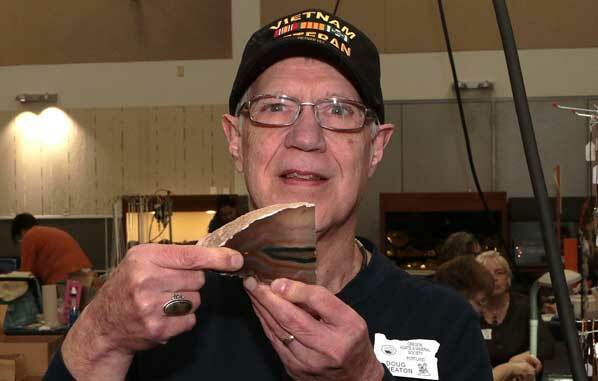 Southeast Portland resident and OAMS Past President Norm Ernst shows a slab of agate he’s polishing. At the exhibit, OAMS demonstrated the equipment and processes used to prepare rocks for display. As a longtime partner to the science museum, the group donates the proceeds of these shows to OMSI’s Hancock Field Station, located in Central Oregon’s John Day River Valle – an area world renowned for its fossil-rich rock. 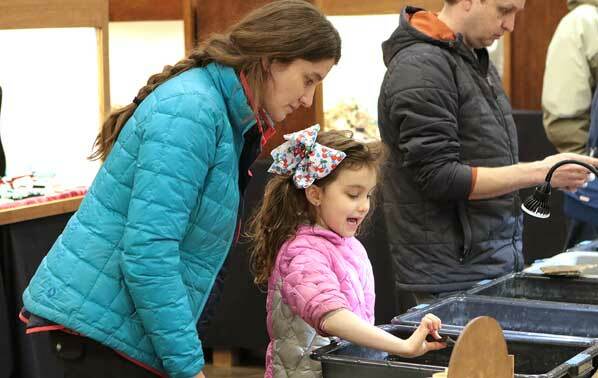 Avid “rock hounds” look through collections of stones and minerals for sale at the show. 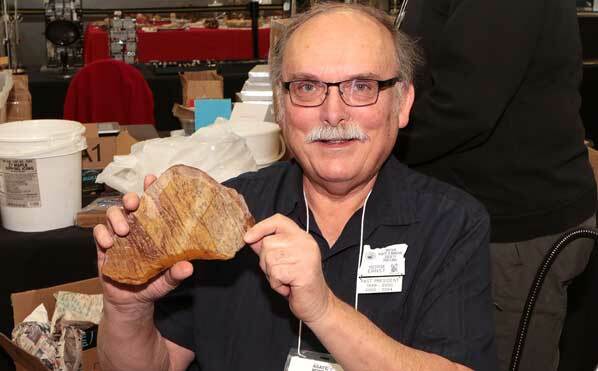 If you are ready to rock, learn more about Oregon Agate and Mineral Society at their website: CLICK HERE to open their home page.